Stainless steel lunch boxes are lightweight, eco-friendly, safe, and well, practical for green families, but often they lack the color and character to attract kids. 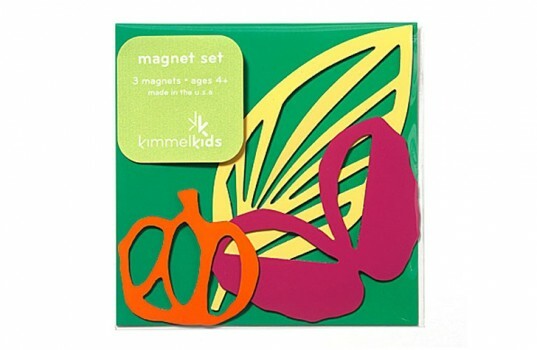 But Kimmel Kids Roving Gallery lunch box is a stainless steel option that comes with three brightly colored magnets so kids can decorate it differently every day. 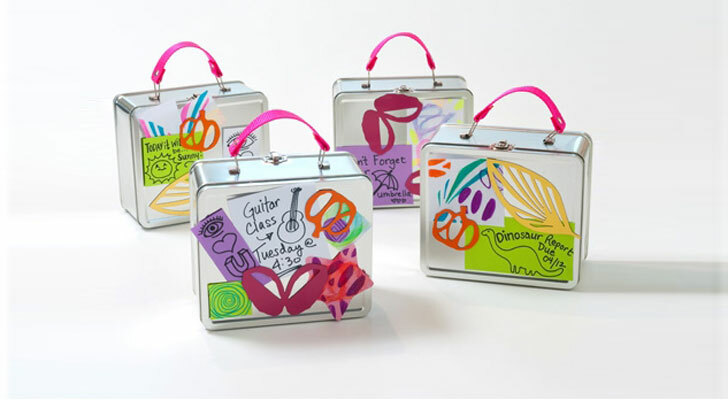 The idea is that you can turn the lunch box into a roving art gallery. Your little artist can show off his latest doodle, or you can a attach a note to tell your kid how much you care or give a clue about the tasty treat inside. Since the magnets are stencil-like, you can see through them to view the artwork displayed underneath. The made in the USA lunch box set is sure to bring a little fun back to basic eco-friendly lunch boxes. And, if your kid begs for a new lunch box again next year, you could easily turn this one into an art supply tote. Your little artist can show off his latest doodle, or you can a attach a note to tell your kid how much you care or give a clue about the tasty treat inside. Since the magnets are stencil-like, you can see through them to view the artwork displayed underneath. The made in the USA lunch box set is sure to bring a little fun back to basic eco-friendly lunch boxes. And, if your kid begs for a new lunch box again next year, you could easily turn this one into an art supply tote.